MEXICO – Students and staff of the Center for Instruction, Technology and Innovation gathered on September 11 for two remembrance ceremonies conducted by the public safety and justice students from the Career and Technical Education department in the morning and in the afternoon. 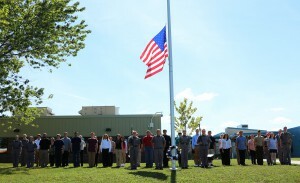 CiTi Public Safety and Justice students stand in remembrance of September 11. He urged the audience to watch the news, to remain vigilante and to pay attention to what is happening in our community, our nation and our world. Assistant Superintendent for Instruction Roseann Bayne spoke at the afternoon ceremony; she shared her memories and feelings of where she was when the towers fell, saying that the event not only impacted New York City, but our entire nation and the world.